Smart Downloads only works on TV shows for now. When the feature is enabled, you can basically pick a floating buffer of episodes. For example, downloading three consecutive episodes means Netflix will keep three episodes queued up. Watch the first one, and it deletes that one before grabbing the next in the series, so you still have three unwatched to go through. 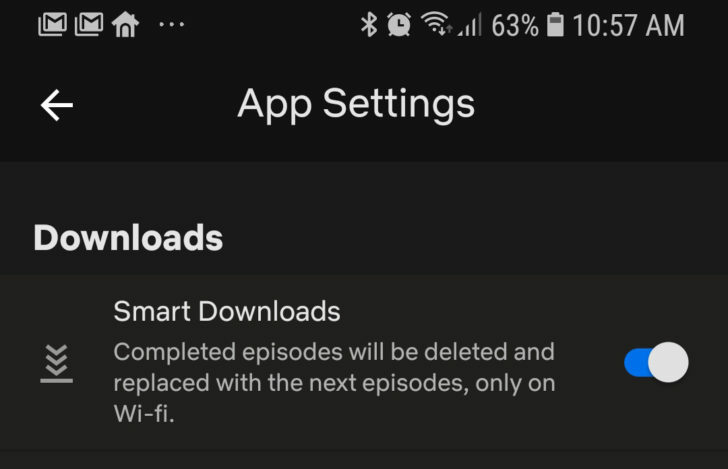 You can turn Smart Downloads off in the app settings if you don't want it to manage downloads for you. Smart Downloads will also only work on WiFi. Netflix says this feature is live in the latest version of Netflix for Android, and it is appearing for me without any updates or sideloading, but I'm on the beta channel. It's probably a server-side switch. Enjoy.